Barb’s journey towards Ironman Canada! The day I became an Ironman! The sport of triathlon has always intrigued me but I could not swim a length without being exhausted. Five years ago I started taking swimming lessons and then started to do a few sprint and Olympic distances. 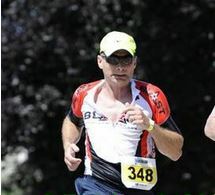 In 2010 I wanted to celebrate my 50th birthday by completing a half ironman distance race. The race I selected was the Mussellman triathlon. It was a great accomplishment to achieve that day; however I was left with a feeling of “unfinished business”.